The first time I went into an Inipi…’sweatlodge’ (and I write about this in my book)…everyone spoke their Prayers aloud. Having been brought up a Baptist where our Prayers were unspoken, I worried that I would be judged on how I spoke with the Creator. What I heard that night humbled me and brought a new awareness to my soul. The Elder who poured the water that night told us that the spoken Word has power and he spoke of a quote in the Bible that states “In the beginning was the Word”. He told us that when we speak our Prayers aloud, it goes out into the world to be Created. That’s when I began to hold the idea that it was important to know what was in the hearts of The People by listening to o ur Prayers. I have this idea that speaking aloud what is in our hearts, can inform us what it is we TRULY think and feel. Some years later, I came to know another Elder that poured one of the most beautiful, one of the most loving lodges I ever experienced! In his lodges, I connected with the Creator in a very real and Sacred way. He would briefly share a teaching at the beginning/end of each door but most of the time he invited us to Pray/Talk with the Creator in the deepest way imaginable. He told me later that he felt it was his duty to provide a safe and Sacred place for us to Pray. That he felt ‘guided’ by the Creator to let each of us talk with the Creator…to truly share what was in our hearts. I owe much to these two Elders for this teaching because…for those who pour water and talk and talk and talk…all I hear is them…I cannot hear the Creator for all the ‘noise’. I came to know a long time ago that in our ways, we don’t need a “middle-man” to speak for us with the Creator. We all have a direct connection to the Creator…and sometimes all we need is the opportunity to hear and honor what is in our hearts by our Prayers. This is good for the Community as a whole. Yes, we have all needed the guidance of the Elders…and that will never change…but at a certain point, it is good to walk, and be guided by, the Creator directly. I, Lynn Manyfires, speak this in a good way…hetcetu. Haho. © Lynn Manyfires and 'Many Fires of Spirit', 2009-2016. Unauthorized use and/or duplication of this material without express and written permission from this site’s author and/or owner is strictly prohibited. 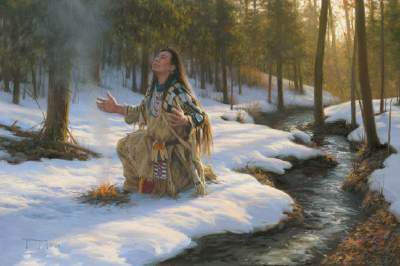 Excerpts and links may be used, provided that full and clear credit is given to Lynn Manyfires and 'Manyfires of Spirits' with appropriate and specific direction to the original content.